It is a beautiful fall week in Northern New Jersey. The air is crisp and the leaves are falling and changing more and more everyday. There is just a great smell when the fall is in full force, just LOVE it!!! When we take the puppies out, remember there are five in total, we can hear the acorns falling and when the leaves blow and the squirrels are scampering the pups love to chase them BOTH, which adds excitement to their day, ours not so much, LOL!!! I added some fall decorations to Audrey’s kitchen. She has such a beautiful Gothic table in one corner that I thought would look so pretty with doilies placed on top with a large white pumpkin we found on one of our garden center trips. We also purchased these gourds on another trip and I placed them in front for color. 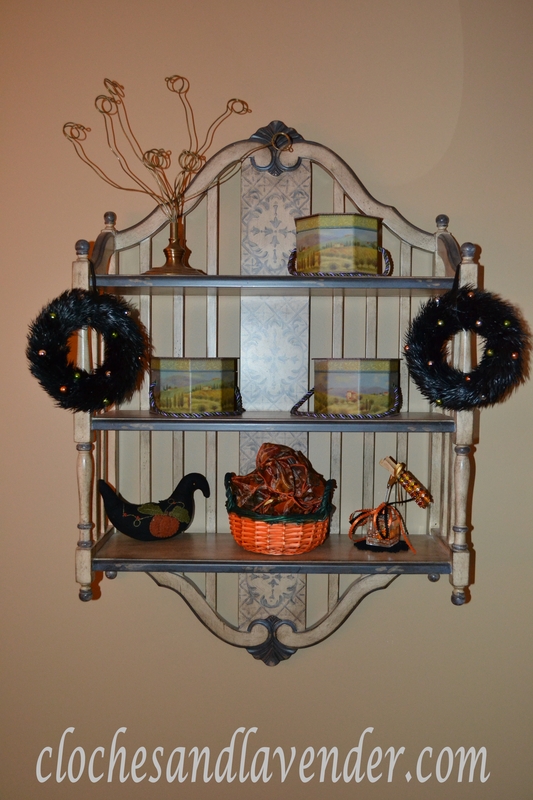 The shelf on the side has a pumpkin and bottle brush wreathes with a couple of accessories. For her island, for some fall flair, I placed a three-tier wired piece that she purchased on one of our many trips to Home Goods. I used some rust burlap I purchased at Michael’s to give it color. I chose gourds and some pieces she has displayed in her butler’s pantry. They are tiny glass pumpkins and fall napkin holders. Audrey likes these displays added to her kitchen very much. Wait until I show you her fall display in her butler’s pantry, very festive!!! Last, she has a small area she uses as her a coffee center for parties. I thought this would be a great place for a small touch of fall. I placed pumpkins and pinecones she had and an autumn bottle in this spot. In the items that Audrey had this large martini glass and I though it would add the right touch to this spot. It sounds like you are getting to decorate for Fall at your friends, Cynthia. That’s great, and I’m sure you are collecting ideas for what you want to do at your new home next year. I am and I have been pinning away this fall for next year! Loving all the gourds and that white pumpkin is perfect!! I adore fall, I wish it was like this all year long, LOL!!!! This is so pretty! I adore the shelf! You have decorated this beautifully! Everything is so welcoming! Oh Betsy thanks so much. I try my best. It is hard when it isn’t your home and your things. Cynthia, what pretty accents! Everything is so perfect for the season! Shenita thanks so very much. The last time you posted I wasn’t allowed to leave a comment for some reason and I signed up again and haven’t received any posts so I hope I am not missing anything. I love your posts!!! Just beautiful Cynthia – love love love that shelf – and those wreaths!!! Your girlfriend must have been thrilled? Am brand new to your blog and am loving every bit! Would you by any chance know where I might obtain a copy of Nina Hartmann’s Christmas book? Can’t seem to find one anywhere! Thank you so much! Wow, you’ve been busy. I love love the 3 tiered baskets. I always look at them but haven’t bought one yet. I love what you did with the mantel too. I always struggle with my mantel. It always seems like it needs “something else”…. The mantle doesn’t usually give me a problem, shelves do for some reason. Maybe when our new home is done I will grasp it, LOL! 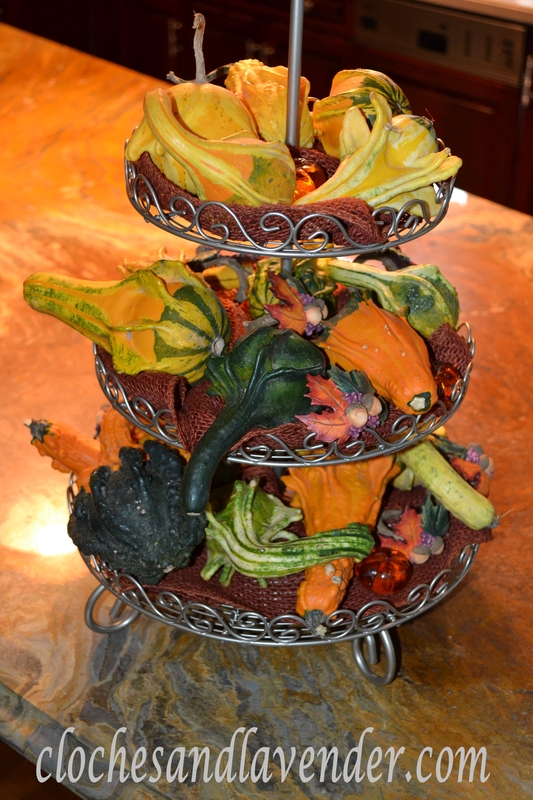 Love the fall touches you added to your friend’s kitchen…..very pretty! I can’t imagine walking five dogs, what a job that must be! LOL!!!! I take care of my two and my friend takes care of her three. It is a riot on the couch at night. We have pictures and I am going to do a short post. 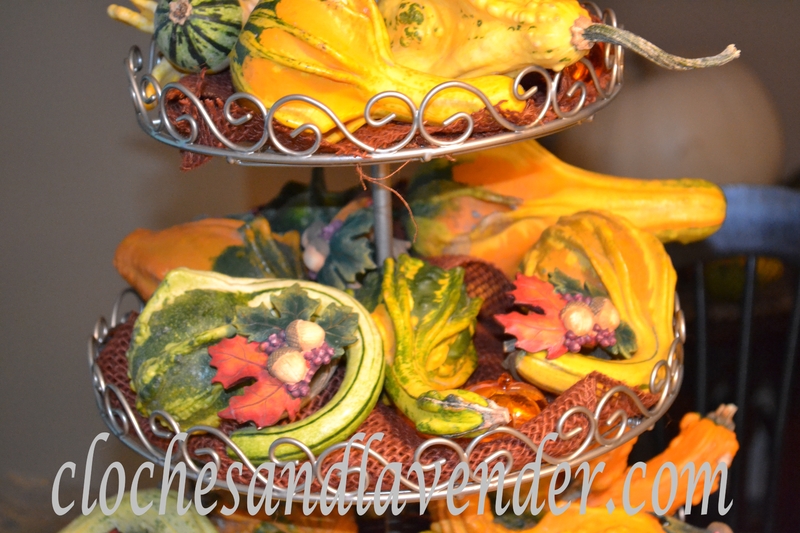 That cake stand with all the gourds is gorgeous, Cynthia. I bet you can’t wait to get into your own place and start decorating!! Oh man I can’t wait, Heather!!! Did you have a nice Thanksgiving?? I know you must miss decorating your home….So nice of you to decorate your friend’s home … I am sure she loves it as you did a beautiful job!.. Thanks Shirley but I can’t wait to do our new home Next year. I have been Pinning away! Thanks Daniela. I can’t wait for next fall to tell the truth to decorate our new home! Cynthia, great job on Audrey’s kitchen. 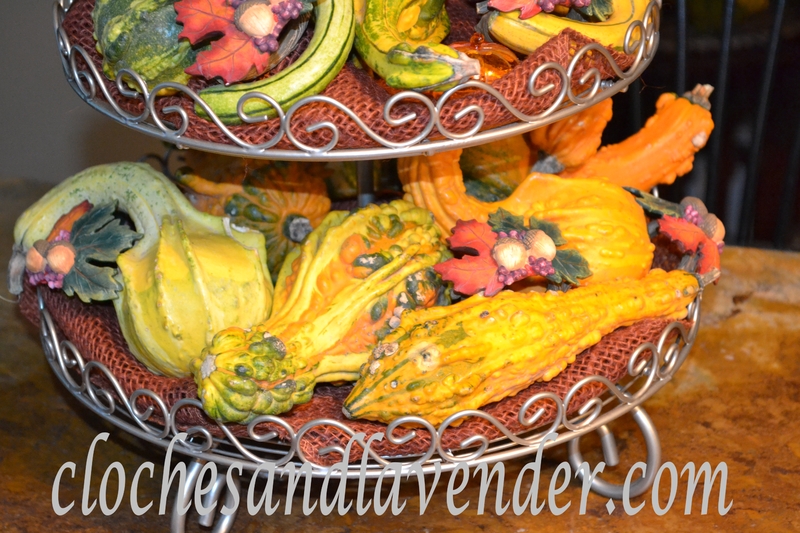 I love the gourds on the tiered shelves. Thanks so much Carlene. I have been pinning away to help me with ideas for next year for our new home! You’ve done a great job adding Fall color in the kitchen! Gourds and pumpkins are perfect for that. We are feeling quite a bit of cool air here in GA, but still waiting on the pretty Fall color to surround us! We have so much color in NJ right now and really cool temps. are moving in!!! Beautiful Fall touches Cynthia! I love the tiered tray. We had a beautiful day here today. Thanks so much Jann. We are really getting some fall weather here now it is great! I host a weekly link party called “Seasonal Sundays”. It’s about all things seasonal and I’d love to have you link. The link goes up Saturday evenings at 7 pm EST. Thanks so much. I will be sure to link up next time. I am afraid that no one will look since it is so late. Hi Cynthia! Audrey’s kitchen is looking so pretty with all the Fall decor you’ve sprinkled around. Happy Fall to all of you and the puppies, too. Kitty thanks so much. It was nice to do some decorating. Thanks for remembering our babies!!! Oh girls you are so kind to me. Thank you a million times over! So many pretties for fall in the kitchen! 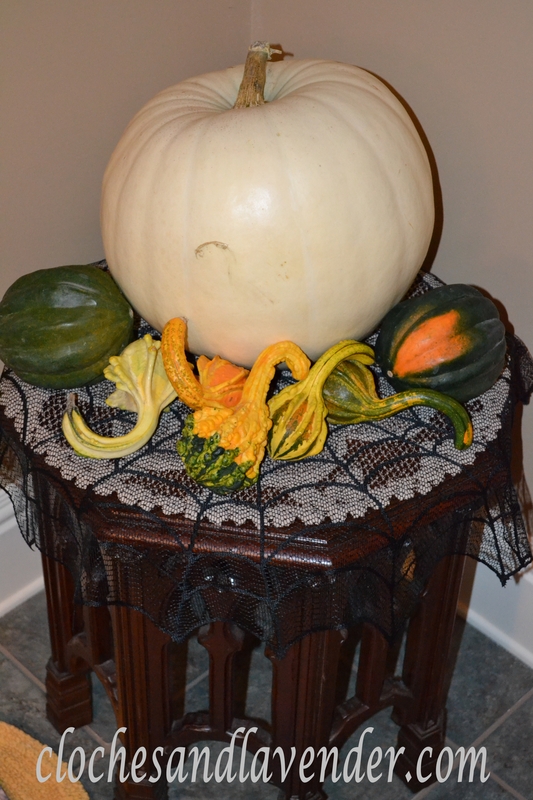 I love how you’ve used real gourds and pumpkins in your displays. Thanks so much Mary Alice. In our own home I used a lot of faux pumpkins but I really enjoyed using the real thing. In our new home I will use the real thing and I think I will do some painting on the faux ones. I like it so much better and where we are going I will be able to use the real thing outside!!! No more animal problems. Just beautiful! I love all the wonderful Fall touches you did! Your friend must be thrilled! Thanks for sharing all the great ideas too! Thanks Jody for stopping by. My friend really does like everything I have done!